I have to apologize to you for yet another pumpkin recipe. I swear that my 29 oz can of pumpkin is growing. All these recipes you have been seeing me post has been with the same can of pumpkin and I still have left overs! Plus I must have made a bazillion pumpkin frappes, yet I still have pumpkin. But hey, honestly I’m not complaining! I love it!! But I think you know that! I promise tomorrow will not be a pumpkin recipe, I think? No it won’t be!! This french toast is friggen awesome!!! 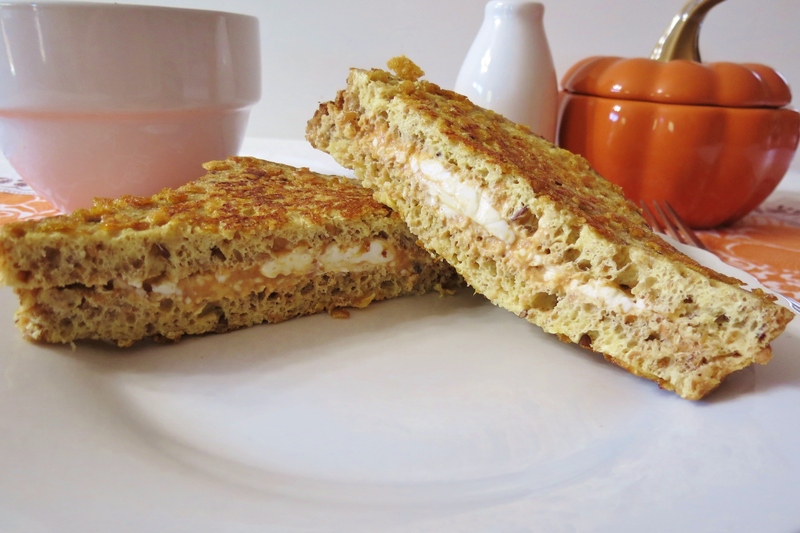 It’s crunchy on the outside, moist in the center and tastes like pumpkin cheese cake with the drizzle of maple syrup. Oh my gosh!!! This is so good!! The taste is WAY better than the photos. I took them first thing in the morning and the sun wasn’t out, so the pictures did not turn out the way I have hoped. Last night their was a marathon of Diners, Drive-Ins and Dives on Food Network and all I kept seeing were pancakes and pizza. As soon as I woke up, I kept thinking pumpkin pancakes, but then I thought I should try something different, so I did and I am glad that I did. These turned out so yummy!!! I made my pumpkin mixture, dipped the bread in egg and then dipped in crushed cornflakes. 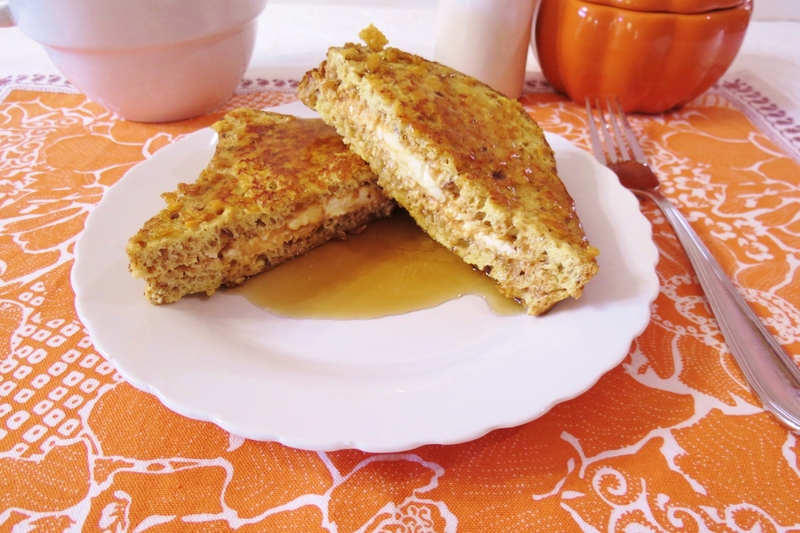 Have you every had crushed cornflakes on french toast? 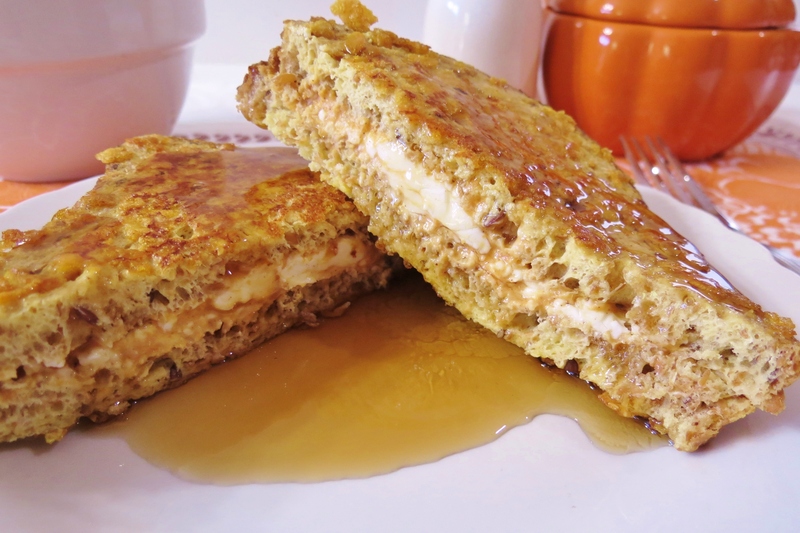 You should, it just brings an extra layer of texture to french toast. I just love it that way!! 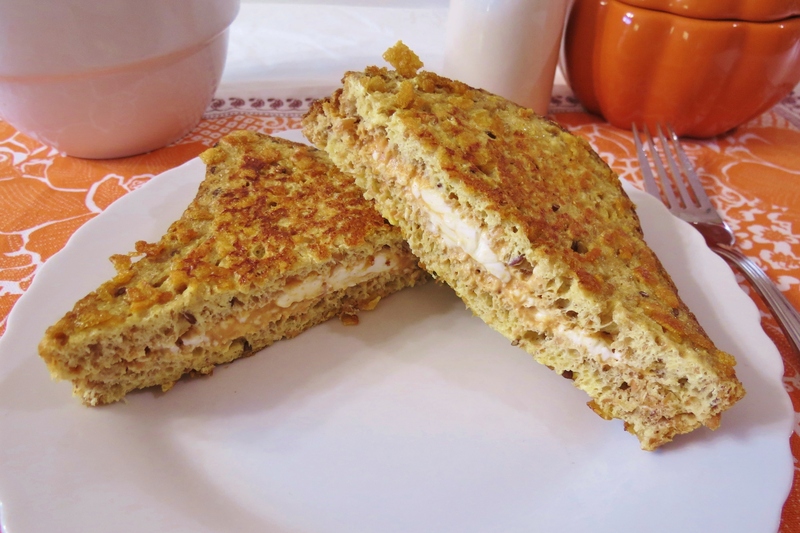 A sweet and crunchy french toast topped with cornflakes and stuffed with pumpkin and cream cheese. In a small bowl, mix together, cream cheese, pumpkin, stevia and pumpkin pie spice. Spread mixture onto bread. Put bread slices together to make a sandwich. In a shallow bowl, add egg, milk, and vanilla, mix until combined. In another bowl, add crushed corn flakes. Spray a skillet with cooking spray and set over medium heat. Carefully take bread and dip in egg mixture, coating both side of the bread. Then dip both sides of bread into corn flake mixture. Place in the skillet and cook each side until golden brown. About 2 - 3 minutes per side. It’s time to whip up something fun for lunch!! Hmmm, thinking french toast again, but I only allow myself one bread meal a day!! I have to draw the line somewhere. I have the same problem… my giant can of pumpkin seems to last forever! (not that I mind all that much 🙂 ) But once the pumpkin starts… it just keeps coming. I finally made several baked oatmeals with it so it would keep better! I love baked oatmeal and incorporating pumpkin into would be wonderful!! Ohhh, cinnamon puffins sound great!! I saw those at the store and almost bought them. I never had them, but I am sure I would love them. If you make this, let me know what you think of it! I like the idea of the bit of crunch that would come from using cornflakes! Yes the cornflakes give it a crunch! I love putting that on my French Toast!! Just makes it a little more fun! I’m already ridiculously excited about opening one of those giant pumpkin cans 🙂 This looks fantastic! Oh my gosh I opened one can, and I love using it up!! Darn that pumpkin!! What a delicious treat! It looks amazing, and it’s the perfect time of year for pumpkin. Thank you!! Makes for a great, filling breakfast! PLEASE keep them coming – I am new to the Blog, and pumpkin is my favorite!!!!!!!!!! Glad you love pumpkin, because there will be plenty of pumpkin recipes this fall. Matter in fact, I thought f a new one that I can’t wait to try out. But that won’t be till a little later!! Glad you found me! Please stop back anytime. Love to hear about the baked oatmeal recipes mentioned above! I am all stocked up on pumpkin for the winter (Thank you Costco! 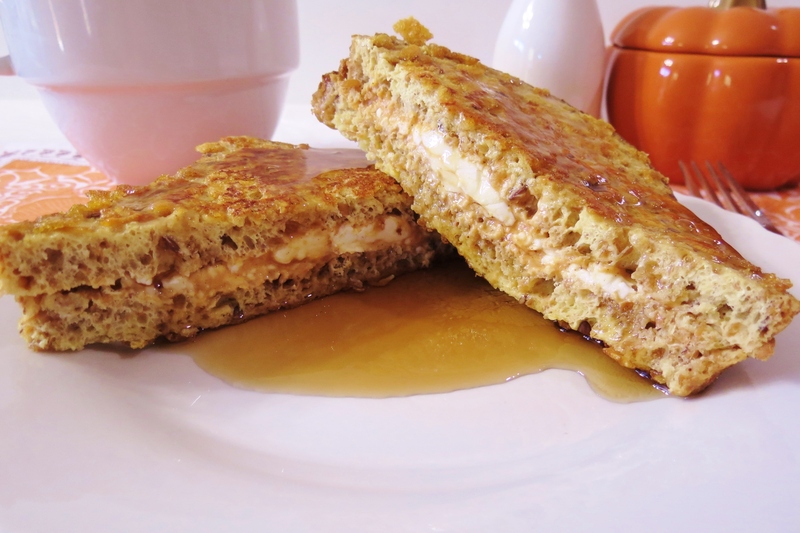 ), and I cannot wait to use some in french toast – this looks uh-mazzzzing! You NEVER have to apologize for more pumpkin recipes 🙂 I love pumpkin and this looks so scrumptious! I can’t wait to try the recipe. Thanks so much for linking up last week to Creative Thursday. Can’t wait to see what you have for this week’s party! Have a great week. Thank you for having me Michelle!! To see the post & to grab your featured button, just click the link. how well do you think these would hold up in the freezer? I’m not sure to be honest! I would make one and see how it goes. I’d imagine they should be pretty good since I freeze bread all of the time. I would probably take it out the night before I was ready to use it and put it in the fridge and maybe warm up in the oven. I think in the microwave it mighty get soggy.